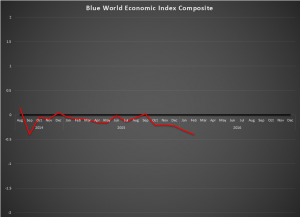 February was not a good month for the U.S. economy according to the Blue World Economic Index™ composite, which settled at -.40 which is .08 lower than January. Of the eight major categories, six were negative including General, Employment, Inflation, Retail, Services, and Manufacturing. Real Estate broke dead even at 0.0, with Consumer measures remaining level and positive at .2. In spite of all that, there were a couple of late reporting bright spots that may hint at a better March. There were some notable conflicting data sets this month with Durable Goods and Industrial Production posting unexpectedly strong gains, which lifted Manufacturing to close the month fractionally higher than January even though it had fallen sharply at mid-month. Of the twelve Manufacturing reports the index follows, including the Regional Fed reports, they were two of only three positive readings. Let’s hope that starts a trend. Some authors have suggested that the Personal Income and Consumption data are in conflict between their individual readings and the GDP figures, which both posted Friday the 26th. We have to remember, however, that the GDP report reflects the 2nd revision to Q4 2015, meaning they are lagging while the Personal Income and Outlays report is current for January 2016. That said, the upward revision to GDP appears to be on the back of unwanted inventory build, and we’ve spent way too much time below 3%. Personal Income and Outlays, however, did hint strongly at optimism for a better March. Let’s hope that materializes. Don’t miss the Blue World Jobs Report Analysis this Friday the 4th. An odd twist! Usually we have what appears to be a respectable number at the headline and much weaker indications in the detail. This month, and we can’t remember another, the opposite is true. We’re not saying the underlying is stellar. In fact it’s rather flat but compared to what we expected it was a pleasant surprise. The headline says 151k. It’s actually 158k for the private sector, as the government shed 7k jobs in January. There was a slight uptick in the participation rate which, while still ridiculously low, is on a 2 month “winning streak.” The quotes are because we were deriding the number a year ago and this is .2 below that, but up is up! The labor force was essentially even, the number of those unemployed fell slightly, as did the number of those not in the labor force so all in all we’ll call it flat. After wincing at the headline this morning, we’ll take it. While the data was better than we expected, there is some concern over discrepancies with other reports out over the month. We won’t go through all of it but an example is manufacturing. The Blue World Economic Index™ was published on Monday of this week, and Manufacturing set a record low for the sector and the index at -.91. As of this morning it sits at -.98 and nothing points to any good news there, yet today’s job report shows healthy gains in all three subdivisions, durable, non-durable, and motor vehicle parts. Motor vehicle parts is the only one that makes any sense at all. So there are some things that don’t necessarily line up, but that happens occasionally, and they usually come back in line. We keep fielding questions about the Fed, and we definitely feel they are suffering from “hiker’s remorse.” The markets are tanking, the economy is slowing, and there is a lot of talk of recession lately. All of that said we will, of course, monitor and evaluate month by month, but right now we’re pretty comfortable thinking there will be no further hikes in 2016. We certainly wouldn’t advise any, but they haven’t asked us…yet! January was not a very good month for the economy according to the Blue World Economic Index™ which posted its worst showing since we began publishing it publicly in 2014. The composite index came in at -.32 with deterioration in all but two (Employment and General) major categories. Manufacturing continues to get thumped and is the most notable negative at -.91, a reading we have not seen since the inception of the index. While there is food for both hawks and doves in the individual reports, overall we are showing an economy that was, in our opinion, not ready for the rate hike and certainly not ready for more. There is, of course, a growing chorus of voices joining our assessment in the financial media. Let’s hope for a better February. Watch for the Blue World Jobs Report Analysis which will be out this Friday.